Wild Turkeys are large game birds with a rather awkward appearance. The wild turkey is one of the largest birds in North America. An adult male can grow up to 4 feet long from his beak to his tail. Wild turkeys live in open fields and woods and nest on the ground. Wild turkeys are quite different from their domestic cousins. They are smaller and faster and can fly very well. They live and move in flocks. Although they are considered wild animals, they can be unbelievably fearless. 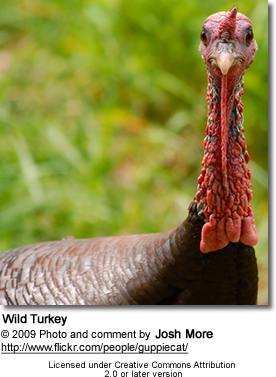 Surprisingly, wild turkeys are powerful flier, reaching speeds of up to 55 mph over short distances. Domestic turkeys have grown in size and have lost the ability to fly. They are more tolerant of humans and are accustomed to handouts from feeders. 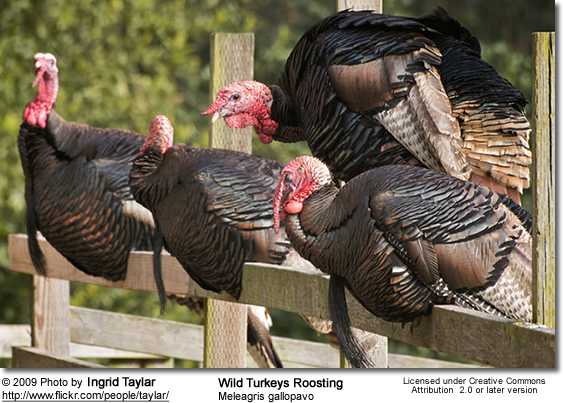 The wild turkey is the largest North America game birds. On average, male turkeys weigh about 18 pounds. The largest wild turkey on record weighed 37 pounds. Females are smaller and duller. They weigh between 8 to 10 pounds. A male bird can stand 5 feet tall. They measure 117 cm (46 in) from beak tip to tail tip; females measure 94 cm (37 in). Both male and female have a long neck, featherless blue head, strong spurred legs, and a fan-shaped tail.Male: Dark iridescent feathers overall, red wattles on the throat, and a dark tuft suspended from the breast.Female: Duller than the male, lacks wattles, and often lacks a breast tuft. smokey gray color phasemelanistic color phase (all black)an erythritic color phase (reddish coloration)albino color phase (very rare). Male turkeys have featherless necks and heads. They may change color according to the bird's frame of mind. In a calm state, they remain gray or blue. If angry or during courtship, the neck and the head become bright red. They also have spurs in the lower part of their legs. 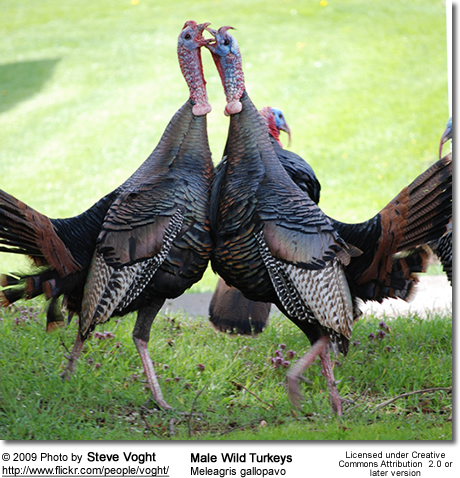 Male turkeys have peculiar fleshy growths on the neck, under the chin and above the beak. The one in the throat area is termed 'caruncle'. 'Wattles' are located under the chin and the 'snood' lies flapping on the beak. The snood is also a hearing organ, and it can perceive sounds five times more effectively than the human ear. Like head and neck, these three pieces of flesh obtain red color in states of mind mentioned above for turkeys. 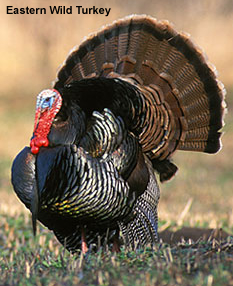 Males turkeys grows a cluster of long feathers from the center of its chest. This cluster is known as the turkey's beard.The beard is actually a group of modified feathers that look like hair. 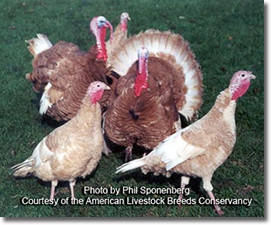 Beards are most commonly found on adult male turkeys (called gobblers), although females (called hens) will grow them occasionally. On adult males, these beards average about 9 inches long. 10 to 20 percent of hens also grow beards. Wild turkey legs are reddish orange.They have four toes on each foot.Male wild turkeys grow large spurs on the backs of their lower legs. These spurs are pointed, bony spikes and are used for defense and to establish dominance.Spurs can grow up to 2 inches in length. The longest spurs on record are 2.25 inches long. Wild turkey tails are usually 12 to 15 inches long and are banded at their tips. The color of the bands in the tail varies by subspecies.Male wild turkeys fan their tails when displaying to attract a mate.You can usually tell the difference between an adult male and a juvenile male (a jake) turkey by looking at a turkey's tail: All tail feathers of adult males are the same length. The feathers forming the center of a jake's tail are usually longer than the rest of the feathers in the tail.